BERLIN, GERMANY – September 4, 2014: Lenovo (HKSE: 922) (ADR: LNVGY) today announced at the 2014 IFA Consumer Electronics Unlimited show in Berlin a portfolio of business and consumer devices that provide tailored solutions to some of the most common business user headaches and that delight consumers in unexpected ways. The lineup starts with the new ThinkPad Helix, a complete business 2-in-1 Ultrabook that elevates thin and light design and takes multimode computing to the next level with the latest state of the art hardware. Lenovo also introduced two new all-in-one (AIO) tabletop PCs: the 19.5-inch HORIZON 2s, Lenovo’s thinnest tabletop PC packed with premium features, plus the 21.5-inch HORIZON 2e, Lenovo’s most affordable tabletop PC. In addition, Lenovo announced the ThinkCentre Tiny-in-One 23, a new way for businesses to customize a secure AIO desktop solution, and the thinner and lighter Edge 15, an ultra-sleek dual-mode laptop for consumers. To meet the needs of business customers wanting a tablet for when they’re on-the-go, and a laptop for an extra level of productivity, Lenovo gives them the best of both worlds with the ThinkPad Helix, now even thinner and lighter and more fully-featured. 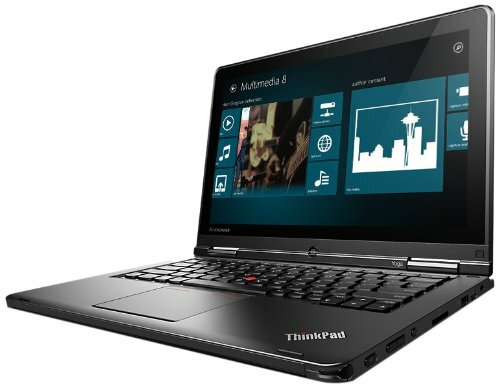 The ThinkPad Helix weighs 2.98 pounds and measures only 0.38 inches, 15 percent thinner than its predecessor. The new ThinkPad Helix sets an even higher standard for business 2-in-1 Ultrabooks with its top-of-the-line hardware and software technologies for unmatched flexibility, productivity and connectivity. This high performance Ultrabook packs even more power with the all new Intel® Core™ M processor, providing even better performance than the previous generation. Running on the trusted build and durability of Think-branded products, ThinkPad Helix also looks great with its sleek and premium finish. Fashioned from an aluminum grip-friendly finish, it provides a professional image for business. The ThinkPad Helix also features astonishing power efficiency and battery life, compared to its predecessor. The ThinkPad Helix retains the five modes users rely on to stay productive – Tablet, Stand, Tent, Laptop, and Desktop. The versatile and detachable ThinkPad Helix allows users to work comfortably typing on its legendary ThinkPad keyboard or to take notes and sketch with its digitizer pen. Then to switch from laptop to tablet, simply rip and go. Or to place it in Tent or Stand Mode, rip and then flip the 11.6-inch laptop’s screen 180° and re-insert into the base. The ThinkPad Helix includes Windows 8.1 Pro and a suite of add-on security options, including biometric fingerprint reader, military-grade smart card reader and three factor authentication. The 2-in-1 also comes pre-loaded with software offerings like Lenovo Settings, Lenovo Companion 2.0, Lenovo Reach and Lenovo SHAREit to keep users’ digital content organized between different devices and files. Lenovo Settings provides users with the ability to control and improve their device’s performance and manage system functions easily, automatically and predictably, while Lenovo Companion 2.0 acts as a central hub for users to easily access and understand their system’s best features, manage system health, view available driver updates, buy customized accessories and check warranty status. Lenovo Reach is a cloud storage service for users to store and access files from multiple devices, and Lenovo SHAREit easily transfers digital content to any smartphone, PC and tablet. Users can choose between the ThinkPad Helix with Ultrabook Keyboard or ThinkPad Helix with Ultrabook Pro Keyboard for even more power with battery life. ThinkPad Helix is equipped with Gorilla® Glass and a large FHD display and can be paired with an optional ThinkPad digitizer pen for additional flexibility and usability. Lenovo’s HORIZON tabletop PCs are continuing to redefine the tabletop computing experience for families. They now come in thinner and lighter models and more budget-friendly models with the HORIZON 2s and 2e, respectively. The HORIZON 2s with the “s” representing “slim” epitomizes the concept of a thin and light tabletop PC at just 0.59-inches and just over five pounds. This machine amazingly shaves 10 pounds off the original HORIZON 2, making it even easier to carry around from room to room in a house or even outside the home. Designed as a dual work and collaborative interpersonal device for play, the new HORIZON tabletop PCs provide the same Stand and Flat modes as previous models. Users can enjoy working in the Windows environment when upright as an AIO and then lay it flat to play games in Lenovo’s Aura interface. For those on a budget, the new HORIZON 2e comes with a 21.5-inch FHD screen starting at just $749. Both the HORIZON 2s and 2e come with up a 4th generation Intel® Core™ processor and genuine Windows 8.1, along with near field communications (optional on the 2e) for a seamless digital content sharing experience, and Bluetooth 4.0 for fast device pairing. Both models feature integrated Dolby® Home Theater® stereo speakers for professional-grade multimedia sound control and optional gaming accessories, including joystick, e-Dice and striker. The integrated battery provides up to 2.5 hours of streaming HD via Wi-Fi on the 2s and three hours on the 2e, providing users with enough power to watch their favorite film a second time without the hassle of plugging in. They also both come pre-installed with more than 40 multi-user gaming and education applications. Lenovo’s new ThinkCentre Tiny-in-One (TIO) 23 modular AIO gives businesses the flexibility to “mix and match” a 23-inch AIO experience with all current ThinkCentre Tiny PCs (sold separately), allowing for separate refresh cycles of a traditional tower setup while offering space saving and outstanding cable management capabilities of an all-in-one PC. Designed specifically for IT managers, the TIO delivers an outstanding business AIO experience with a brilliant 23-inch FHD display, front-access USB 3.0 audio ports, an optional ODD and an ergonomic stand that allows for tilt and height adjustment. Unlike most traditional AIOs, the TIO 23 is powered by a detachable ThinkCentre Tiny PC that seamlessly locks into the back of the monitor within seconds through a simple tool-less setup process. This unique hybrid configuration not only provides users with a clean-desk computing experience free from cable clutter but also allows users to configure their 23-inch AIO with a multitude of different chipsets and CPUs according to their needs, choosing from different ThinkCentre Tiny PC products. When it comes time to upgrade or service the system, users can simply pop the old Tiny PC out of the TIO, drop the new one in and resume back to work in less than two minutes. Users in enterprise, education, and government will particularly enjoy additional ease-of-deployment features such as the single standard Lenovo power adapter to power both the monitor and the Tiny PC. Being VESA compatible, users also have the flexibility to deploy the system on a variety of VESA-compatible mounts, stands, and brackets. TIO offers enhanced physical security for the Tiny PC with an advanced locking mechanism that secures Tiny and the TIO’s optional ODD module inside the system when a Kensington cable lock is attached. To respond to consumer need for an even thinner and lighter dual mode laptop, Lenovo created the Edge 15. At under an inch thin and weighing just over five pounds, the Edge 15 convertible laptop is Lenovo’s thinnest and 15-inch consumer laptop yet. Encased in a premium aluminum chassis, a 300-degree hinge offers users an easy way to transition between its two modes: Laptop and Stand. With the AccuType backlit keyboard and touchpad, using the Edge 15 in Laptop Mode makes typing comfortable on this Windows 8.1 laptop. When it’s time to kick back, flip the Edge 15 into Stand Mode to enjoy intuitive touch applications or make a video call with the integrated 720p HD webcam and crisp dual array digital microphone. The Edge 15 features a 15.6-inch IPS FHD display that supports 10-point multi-touch for a more interactive computing experience. Paired with Dolby® Home Theater stereo speakers and the option of NVIDIA® GeForce® GT840M 4GB graphics or Intel Integrated Intel® HD Graphics 4400, the Edge 15 provides a rich entertainment experience. The Edge 15 also boasts all-day power with an up to eight hour battery1. This makes the Edge 15 ideal for users who don’t want to be tied down with a power cord when on the road, at a business meeting or at the local coffee shop. Under the hood, the Edge 15 packs a powerful punch with up to the latest 4th generation Intel® Core™ i7 processor, 16GB of DDR3L memory, choice of up to 1TB of HHD, hybrid SSHD storage with integrated 16GB NAND flash or up to 256GB SSD storage and Lenovo’s SHAREit software. The Lenovo HORIZON 2s will be available beginning in October with models starting at $949 via major retailers and www.lenovo.com. The Lenovo HORIZON 2e will be available beginning in October with models starting at $749 via major retailers and www.lenovo.com. The ThinkPad Helix will be available beginning in October with models starting at $999 (with Ultrabook keyboard) and will be available worldwide via business partners and www.lenovo.com. The Lenovo Edge 15 will be available beginning in October with models starting at $899 via Best Buy and www.lenovo.com. The ThinkCentre Tiny-in-One 23 starts at $279 and will be beginning October via business partners and www.lenovo.com. Lenovo (HKSE: 992) (ADR: LNVGY) is a US$39 billion personal technology company, the largest PC company in the world, serving customers in more than 160 countries. Dedicated to building exceptionally engineered PCs and mobile internet devices, Lenovo’s business is built on product innovation, a highly-efficient global supply chain and strong strategic execution. Formed by Lenovo Group’s acquisition of the former IBM Personal Computing Division, the company develops, manufactures and markets reliable, high-quality, secure and easy-to-use technology products and services. Its product lines include legendary Think-branded commercial PCs and Idea-branded consumer PCs, as well as servers, workstations, and a family of mobile internet devices, including tablets and smartphones. As a global Fortune 500 company, Lenovo has major research centers in Yamato, Japan; Beijing, Shanghai and Shenzhen, China; Sao Paulo, Brazil, and Raleigh, North Carolina. For more information see www.lenovo.com. 1 Battery life based on simulation results and is an estimated maximum average. Actual battery life may vary based on many factors.